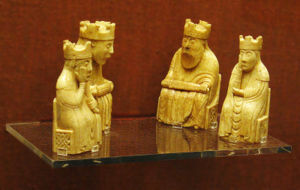 From left, a white king, black rook and queen, white pawn, black knight, and white bishop in a set of Staunton chess pieces. Chess is an abstract strategy board game and mental sport for two players. The object of the game is to checkmate the opponent's king. This occurs when the king is under immediate attack (in check) and there is no way to remove it from attack on the next move. Chess is one of the world's most popular board games; it is played both recreationally and competitively in clubs, tournaments, online, and by mail or e-mail ( correspondence chess). 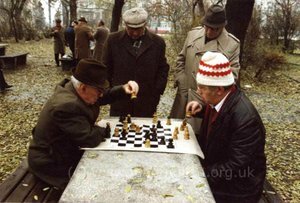 Many variants and relatives of chess are played throughout the world. The most popular are xiangqi in China and shogi in Japan. Other national chess variants include janggi in Korea and makruk in Thailand. The game described in this article is sometimes known as Western Chess or International Chess to distinguish it from other variants. The position of the pieces at the start of a game of chess. 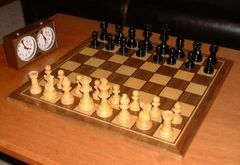 A typical Staunton-design chess set and clock. Chess is played on a square board of eight rows (called ranks) and eight columns (called files) of squares. The colors of the sixty-four squares alternate between light and dark, and are referred to as "light squares" and "dark squares". 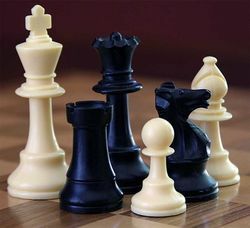 Each player begins the game with sixteen pieces which can move in defined directions, and in some instances, limited range, and can remove (capture) other pieces from the board: each player's pieces comprise eight pawns, two knights, two bishops, two rooks, one queen and one king. One player controls the white pieces and the other player controls the black pieces; the player that controls white is always the first player to move. The players alternate moving one piece at a time (with one important exception) to either an unoccupied square, or one occupied by an opponent's piece, capturing it. With one exception ( en passant), all pieces capture opponent's pieces by moving to the square that the opponent's piece occupies. When a king is under direct attack by one (or possibly two) of the opponent's pieces, the player is said to be in check. When in check, only moves that remove the king from attack are permitted. The object of the game is to checkmate the opponent; this occurs when the opponent's king is in check, and there are no moves that remove the king from attack. Normally a checkmate will require the cooperation of several pieces, but can also be achieved with only one, if the king is blocked by other pieces (e.g. a back rank checkmate). A player who deems checkmate is inevitable may concede the game (resign) to the other player. A drawn result (a tie) is also possible. Chess has been described not only as a game but also as an art, a science, and a sport. It is sometimes seen as an abstract war game; as a "mental martial art", and teaching chess has been advocated as a way of enhancing mental prowess. 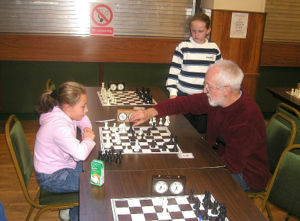 When a game begins, one player controls the sixteen white pieces while the other uses the sixteen black pieces. The colors are chosen either by a friendly agreement, by a game of chance such as pick-a-hand, or by a tournament director. The first player, referred to as White, always moves first and therefore has a slight advantage over the second player, referred to as Black. 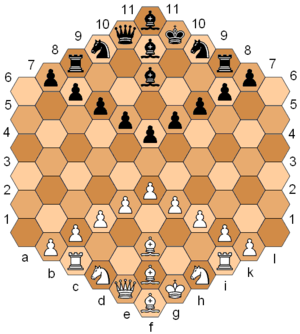 The chessboard is placed so that each player has a white square in the near right hand corner, and the pieces are set out as shown in the diagram, with each queen on a square that matches its colour. Each kind of chess piece moves a different way. The knight can jump over occupied squares and moves two spaces horizontally and one space vertically (or vice versa), making an L shape; a knight in the middle of the board has eight squares to which it can move. Note that every time a knight moves, it changes square colour. A pawn can move forward one square, if that square is unoccupied. If it has not moved yet, the pawn has the option of moving two squares forward, if both squares in front of the pawn are unoccupied. A pawn cannot move backward. When such an initial two square advance is made that puts that pawn horizontally adjacent to an opponent's pawn, the opponent's pawn can capture that pawn " en passant" as if it moved forward only one square rather than two, but only on the immediately subsequent move. Pawns are the only pieces that capture differently than they move. They can capture an enemy piece on either of the two spaces adjacent to the space in front of them (i.e., the two squares diagonally in front of them), but cannot move to these spaces if they are vacant. If a pawn advances all the way to its eighth rank, it is then promoted (converted) to a queen, rook, bishop, or knight of the same colour. In practice, the pawn is almost always promoted to a queen. With the exception of the knight, pieces cannot jump over each other. One's own pieces ("friendly pieces") cannot be passed if they are in the line of movement, and a friendly piece can never replace another friendly piece. Enemy pieces cannot be passed, but they can be "captured". When a piece is captured (or taken), the attacking piece replaces the enemy piece on its square ( en passant being the only exception). The king cannot be captured, only put in check. If a player is unable to get the king out of check, checkmate results, with the loss of the game. Chess games do not have to end in checkmate — either player may resign if the situation looks hopeless. Games also may end in a draw (tie). A draw can occur in several situations, including draw by agreement, stalemate, threefold repetition of a position, the fifty move rule, or a draw by impossibility of checkmate (usually because of insufficient material to checkmate). Chess games and positions are recorded using a chess notation, mostly the algebraic chess notation. The international rules of chess are described in more detail in the FIDE Handbook, section Laws of Chess. Chess openings are a sequence of moves, often memorized, which will help a player build up his position and prepare for the middlegame. Openings are often designed to take hold of the centre of the board (e4, e5, d4 and d5), develop pieces, protect the king, and create a strong pawn structure. The classical school of chess expounds the virtues of occupying the centre early using pawns and/or pieces, while Hypermodernism advocates the control of the centre not by using pawns but with distant pieces. It is often important for a player to castle (a special move that moves the king from the centre of the board two squares towards one of the corners) to protect the king. While studying openings can greatly improve one's results, it is important to understand the underlying reasons for each sequence of moves in an opening. This can greatly reduce the need to rely on rote memorization of the opening phase of the game. Of the utmost importance in the opening is maintaining balance, or equality. The black knight on e6 is pinned to its king by the white bishop, and the white knight is pinned to the queen on b1 by the black rook. Note that the knight on b4 is still free to legally move, while the knight on e6 cannot legally move. When taking and trading pieces, the chess piece point values become important. Valuations differ slightly from book to book, but generally, taking pawns to be worth one point, knights and bishops are worth three points each, rooks are worth five points, and queens are worth nine points. Since the king's loss ends the game, it is invaluable (and the king is never traded). However, in the endgame when there are few pieces left on the board and there is little danger of checkmate, the fighting value of the king is equivalent to about four points. The actual value and importance of a piece will vary based upon its position and the stage of the game. If a player performs a sacrifice (e.g. exchange sacrifice), he is choosing to ignore the standard valuation of his pieces for positional or tactical gains. The beginning player should be aware that points are not an inherent part of the game; there is no scoring and chess was played long before the idea of assigning points to pieces. Instead, points are used by a player to consider whether he will come out materially better than his opponent in an exchange of pieces. For instance, to lose two pawns (two points) in taking the opponent's knight (three points) puts one ahead in material by one point. Such an advantageous exchange of pieces may, however, be a poor tactic if it leaves the opponent with an exploitable advantage in the way the pieces are positioned on the board. Chess combinations and traps do not appear out of thin air. Usually they are present because the opponent has certain weaknesses in his position. These types of weaknesses include: pinned pieces, overloaded pieces, weaknesses around the opponent's king, weak squares, unprotected pieces, weak colour complexes, pieces not able to come back to defend the king, etc. The weaknesses can then be exploited with a chess combination that is often built out of a number of tactical "methods". Such weaknesses are often created in the opponent's position in the first place by threats, provocative moves, and generally strong "positional play", etc. Chess combinations often include a number of types of tactics which many middlegame books classify and provide examples. Such common tactical methods include pins, forks, skewers, discovered attacks (especially checks), zwischenzugs, deflections, decoys, sacrifices, forcing moves, undermining, overloading, interference and even "quiet moves". A fork is a situation where a piece is moved such that two opposing pieces are attacked (forked) simultaneously. It usually is difficult for the other player to protect both of his pieces in one move. Pins are used to prevent the movement of an enemy piece by threatening any pieces behind it should it move. Skewers are a kind of reverse pin where the more valuable piece is placed in front of a less important one. A discovered attack (or revealed threat) is where the movement of one piece reveals a formerly blocked line of attack for another piece of the same colour. For clarification, it should be noted that a "pin" is a tactic - the act of pinning the opponent's pieces. But a "pinned piece" is a specific type of weakness in the opponent's position, which when identified, can be exploited with a tactical combination. A few common positional elements which high level chess players routinely must assess include pawn structure, king safety, space, and control of key squares and groups of squares (e.g. diagonals, open-files, dark or light squares, etc.). In addition, there are factors such as the two bishops that compensate each other's weaknesses. Most middlegame books recommend that once an assessment of the elements of the position has taken place, it is then recommended to try and form a "plan" to create an advantage. Once a plan is formulated, it is then recommended to try and ensure the plan is feasible through the process of checking concrete variations. Great chess writer Aron Nimzowitsch outlined in the classic work My System a number of middlegame positional principles such as "rook on the seventh rank", "undermining the pawn chain", "restrain, blockade and destroy". This work has influenced generations of modern chess players in how they think in the middlegame. During the endgame, pawns and kings become relatively more powerful pieces as both sides often try to promote their pawns. If one player has a large material advantage, checkmate may happen quickly in the endgame. If the game is relatively even, endgame tablebases and endgame study are essential. Controlling the tempo (time used by each move) becomes especially important when fewer pieces are left on the board. In some cases, a player will have a material advantage, but will not have enough material to force a checkmate. In this case, the game is considered a draw by insufficient material. Blitz chess is a version of chess where a chess clock is used to limit the time control for each player. Generally each side has three to fifteen minutes (five is common) for all of its moves. An even faster version of chess is known as bullet chess or lightning chess. Bullet chess's time controls are less than three minutes. Speed chess requires the player to spend less time thinking because if the player's time runs out, he loses. When playing at a faster time, computers become relatively more powerful than humans. If both players use computers to enhance their strength, it is called advanced chess. Chess can also be played blindfold. In this case the play is conducted without the players having sight of the positions of the pieces, or any physical contact with them. Moves are communicated via chess notation. Some very strong chess players are able to play multiple blindfold games simultaneously. When two players are separated by great distances they can still play chess. Correspondence chess is chess played through the mail, e-mail or special correspondence chess servers. Today, chess is often played on the internet through the telnet-based hosts (such as ICC and FICS) and TCP/IP based servers (such as Playchess and WCN). One of many chess variants: Glinski's hexagonal chess. Chess variants are forms of chess where the game is played with a different board, special fairy pieces or different rules. The number of possible chess variants is unlimited. D.B. Pritchard, the author of Encyclopedia of Chess Variants, estimates that there are more than two thousand chess variants , confining the number to published ones. Many chess grandmasters played chess variants and some even invented new ones. José Raúl Capablanca feared a "draw death" of chess and suggested making the board larger and adding new pieces, such as a combination of rook and knight and also a combination of bishop and knight. He played a number of test games and finally setlled on an 8x10 chess variant, Capablanca chess . Bobby Fischer objected to what he considered to be an overemphasis on memorized chess openings in normal chess, and the Russians fixing matches. Thus he devised a formalisation of the variant Shuffle Chess in response. In this chess variant, which he originally named Fischer Random Chess but is now typically called Chess960, the initial position is selected randomly before each game. This random positioning makes it almost impossible to prepare the opening play in advance. 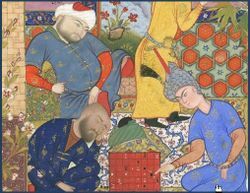 A Persian youth playing chess with two suitors. A form of chess was played in Persia as early as the 3rd century. Many countries claim to have invented chess in some incipient form. The most commonly held view is that chess originated in India , since the Arabic, Persian, Greek, Portuguese and Spanish words for chess are all derived from the Sanskrit game Chaturanga. In addition, in the past only India had all three animals, horse, camel and elephant, in its cavalry, which represent knight, bishop and rook in chess. The present version of chess played throughout the world ultimately derives from a version of Chaturanga that was played in India around the 6th century. It is believed that the Persians subsequently created a more recognizable version of the game called Shatranj. Another theory exists that chess arose from the similar game of Xiangqi (Chinese chess), or at least a predecessor thereof, existing in China since the 2nd century BC. Scholars who have favored this theory include Joseph Needham and David H. Li. Chess eventually spread westward to Europe and eastward as far as Japan, spawning variants as it went. The game spread throughout the Muslim world after the Islamic conquest of Persia. When it entered the Muslim world, the names of its pieces largely retained their Persian forms but its name became shatranj, which continued in Spanish as ajedrez and in Greek as zatrikion, but in most of Europe it was replaced by versions of the Persian word shāh = "king". There is a theory that this name replacement happened because, before the game of chess came to Europe, merchants coming to Europe brought ornamental chess kings as curiosities and with them their name shāh, which Europeans mispronounced in various ways. Chess eventually reached Russia via Mongolia, where it was played at the beginning of the 7th century. It was introduced into the Iberian Peninsula by the Moors in the 10th century, and described in a famous 13th century manuscript covering chess, backgammon, and dice named the Libro de los juegos. The entrance of chess into Europe is marked by changes to the rules, including changes to the moves of the bishops, pawns and queen, with the modern form emerging since 15th century. Early on, the pieces in European chess had limited movement; bishops could only move by jumping exactly two spaces diagonally (similar to the elephant in xiangqi), the queen could move only one space diagonally, pawns could not move two spaces on their first move, and there was no castling. By the end of the 15th century, the modern rules for the basic moves had been adopted from Italy: pawns gained the option of moving two squares on their first move and the en passant capture therewith, bishops acquired their modern move, and the queen was made the most powerful piece; consequently modern chess was referred to as "Queen's Chess" or "Mad Queen Chess". The game in Europe since that time has been almost the same as is played today. The current rules were finalized in the early 19th century, except for the exact conditions for a draw. The most popular piece design, the "Staunton" set, was created by Nathaniel Cook in 1849, endorsed by Howard Staunton (a leading player of the time), and manufactured originally by Jaques of London. The style was officially adopted by Fédération Internationale des Échecs (FIDE) in 1924. Chess is an organized sport with structured international and national leagues, tournaments and congresses. Chess's international governing body is FIDE (Fédération Internationale des Échecs), which has presided over the world championship matches for decades. Most countries of the world have a national chess organization as well, who in turn are members of FIDE. FIDE is a member of the International Olympic Committee (IOC), but the game of chess has not ever been part of the Olympic Summer or Winter Games. Chess does have its own Olympiad, held every two years as a team event. Correspondence chess tournaments are usually played under the auspices of International Correspondence Chess Federation (ICCF). The ICCF awards its titles International Master, Senior International Master and Grandmaster - these are equivalent to similar titles awarded by FIDE for over-the-board chess. In order to rank players, both FIDE and ICCF use the Elo rating system developed by Arpad Elo. For most, the ultimate chess competition is the World Chess Championship. The current World Chess Champion is Vladimir Kramnik, who won a match against Veselin Topalov in 2006. In women's chess, the reigning Women's World Champion is Xu Yuhua from China. However, the world's highest rated female player Judit Polgar has never participated in the Women's World Chess Championship, instead preferring to compete with the leading men. Other competitions for individuals include the World Junior Chess Championship, the European Individual Championship and the National Chess Championships of countries around the world. 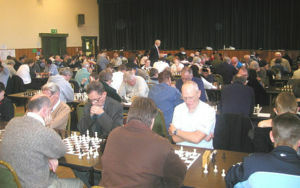 Regular team chess events include the Chess Olympiad and European Team Championship. The 37th Chess Olympiad in 2006 was held in Turin, Italy. Armenia won the gold in the men's event, and Ukraine took the top medal for the women. The International Correspondence Chess Federation runs the World Correspondence Chess Championships both unrestricted and for women. The World Chess Solving Championship is both a team and an individual event. Besides these top chess competitions, there are thousands of other chess tournaments, matches and festivals held around the world every year. The most popular would include Spain's Linares event, Monte Carlo's Melody Amber tournament, the Dortmund Sparkassen meeting and Wijk aan Zee's Corus tournament. The idea of creating a chess playing machine dates back to the eighteenth century. Around 1769, the chess playing automaton called The Turk became famous before being exposed as a hoax. Serious trials based in automatons such as El Ajedrecista were too complex and limited to be useful. Since the advent of the digital computer in the 1950s, chess enthusiasts and computer engineers have built, with increasing degrees of seriousness and success, chess-playing machines and computer programs. At first considered only a curiosity, the best chess playing programs — like Rybka, Hydra etc. — have become extremely strong players. In blitz chess, they can beat the best human players; at regular time controls battles between the very best chess programs and the very best human players have been balanced. Garry Kasparov, then ranked number one in the world, played a six-game match against IBM's chess computer Deep Blue in February 1996. Deep Blue won the first game, but Kasparov convincingly won the match by winning three games and drawing two. The six-game rematch in May 1997 was won by the machine (informally dubbed Deeper Blue) which was subsequently retired by IBM..
Computers are important to today's chess also as seconds with huge databases of past games and a high analytical ability, and they also allow to play over internet on sites like Free Internet Chess Server or Kurnik, which becomes increasingly popular.